Surrounded by lush mountains and dotted with temples of cultural importance, Chiang Mai is the best hub for exploring northern Thailand. If you’re wondering what to do in Chiang Mai, we’ve got you covered with a list of fun and unique things to do in Thailand’s fourth largest city. We have visited Chiang Mai on a few occasions, and even returned to this charming city to live for 6 months while working online. We are constantly amazed by just how much there is to do in Chiang Mai — from the typical tourist activities to local hotspots to off the beaten path experiences that few travelers know about. We put together a list of 28 of the best unique things to do in Chiang Mai, as well as a couple things to avoid. We hope this helps you plan your trip to Thailand (or fuels your wanderlust!). Know what you're looking for? Jump down the article by clicking the links below. EVERYTHING YOU NEED TO PACK FOR Thailand! There are a few ways to get to Chiang Mai from Bangkok. The easiest way is to take a flight from Bangkok directly to Chiang Mai. It's only an hour long flight and they can cost as low as $40 USD. Check out the prices from Bangkok to Chiang Mai. If you want more of an adventure, you can take the ovenight train to Chiang Mai. We would recommend leaving Bangkok some time during the day so you can see the beautiful Thai countryside. Check out the train prices from Bangkok to Chiang Mai here. Chiang Mai is the culture capital of Thailand. Around every corner there is beautiful temple and seeing monks in saffron robes on the streets is a common occurrence. If you want to learn about Thai culture and history, this is the place to be. You will spot the iconic saffron robes everywhere you venture in Thailand, but in Chiang Mai you can have the rare opportunity to go beyond gawking and get personal with a monk. There are 5 temples with “Monk Chat” programs in the city, but we chose to visit Wat Suan Dok Temple due to its proximity to town. We spent an hour asking the monks questions about daily life and anything else that popped into our minds. They were incredibly open and willing to talk. I only wished we had thought more about what we would ask them ahead of time because after we left I started coming up with many more questions on some of the hot topics in today's society... What is the Buddhist stance on gay marriage? Guns? Refugees? ISIS? If you have the chance to ask any of these questions, I'd love to know the answers! It's super easy. At Wat Suan Dok, just show up between 5-7 p.m. on a Monday, Wednesday or Friday. You will sign in with your name and nationality and be assigned to a monk. Be sure to wear appropriate clothing that covers your shoulders and everything above your knees. There are three options for massages (Prices are from 2015, and may have increased since then): 1-hour foot massage (150 baht), 1-hour Thai massage (180 baht), and 2-hour Thai massage (360 baht). Responsible travel note: If you decide to get a massage, remember that this isn’t a tourist attraction to be gawked at. These women are trying to make a better life for themselves, and by visiting you are helping contribute to their self-improvement, but it's not a place to leer rudely or take pictures of your masseuse. Our advice is to arrive early. We got there just after 10 in the morning, and weren’t able to get on the schedule until 2:45 p.m. Arrive much later than we did, and you'll be outta luck! Hours: Monday - Friday 8 a.m. to 4:30 p.m. & Saturday - Sunday 9 a.m. to 4:30 p.m.
Where to get the best Thai massage in Chiang Mai? If you love massages, you can't leave Thailand without indulging in a couple (or several!) massages. Not only are they inexpensive, but you can find fantastic quality. If you're hunting for a great massage in Chiang Mai, look no further! Our friend Justine Wharton has put together a detailed article describing where to find the best massages in Chiang Mai. She tried 30 different massage places in the city and ranked her favorites. Insider Tip: Traditional Thai massages involve a lot of cracking and stretching, and can leave some people sore. If you don't think you'll like this "hands on" massage, try a "Neck, Back and Shoulder Massage" or a "Foot Massage" instead. They are quite a bit tamer. There are dozens of temples in Chiang Mai, but Wat Pha Lat is our favorite temple we've visited by far. First, it is surrounded by the jungle, so it has a completely different feel than the temples within the Old City. Second, it can only be reached by hiking, which eliminates many tourists. The crowds at Wat Pha Lat are far fewer than at many of the other temples in Chiang Mai, so it feels really special. After an easy 30 - 40-minute hike on the Pilgrim's Path, you'll be rewarded with bamboo forests, the sound of chirping birds, a trickling waterfall, and monks completing their daily chores. Allow yourself at least 30 minutes to wander around, take photos and enjoy this beautiful place. There is a small stand selling coffee and clean restrooms on the temple grounds. Take a red truck to the D Condo Apartment building (30 baht from old city). Walk west towards the mountain and at the first intersection after D Condo, turn right and walk about 200 meters and turn left. You are now on Pilgrim’s Path road. Keep heading west towards the mountain until you see the trailhead and a motorbike parking area. This is where you will start your hike. It should take you about 30 minutes from the trailhead to reach Wat Pha Lat (1.5 km). Chiang Mai has a market in what seem like every corner of the city. Whether you're looking for elephant pants and other souvenirs, looking to pick up some fresh fruits, or you're wanting to be surrounded by locals, there is a market for you! Chiang Mai Night Bazaar: Open every night of the week, vendors line the street on Chang Klan Road selling every souvenir you can imagine from t-shirts to stuffed elephants to pillow cases to jewelry. Saturday Night Market: Starting from the Old Pagoda by the south gate and stretching down the Wua Lai Road, this is another souvenir market. Sunday Night Market: Tha Phae Gate is where this market starts and the vendors and crowds pack down Rachadamnoen Road into the old city. There are plenty of food stalls and vendors selling anything and everything. Warorot Market (Kad Luang): This is where many locals shop for clothes or home goods. It's cheaper than the tourist markets but is only open during the day. Jing Jai Market: Here you'll find cute coffee shops and stores, but the main reason to visit Jing Jai is for their organic produce market every Wednesday and Saturday morning. Bor Sang (Umbrella Village) Market: A little outside of Chiang Mai, this market is famous for its handicrafts and popular decorated umbrellas. Go here for a color explosion. Malin Market: This is our favorite market to get dinner and do some shopping. If you are over by Chiang Mai University, pop over to Malin Night Market. There are artists selling jewelry and clothes stalls with cheap price tags (not souvenir-type items). The food court is great too! You won't find many forigners here -- mainly Thai university students. Responsible Travel Tip: When shopping at Chiang Mai's many markets, don't forget to bring your own reusable bag and turn down plastic ones whenever possible. Check out this article for more eco-friendly travel gear! Someone told us once that if you haven't visited Doi Suthep, then you haven't visited Chiang Mai. Now, we don't fully believe that, because one place can't simply make a city. But after been to Doi Suthep, I can't believe it took us so long! This one of the most beautiful temples in Thailand. Plus, you'll also have a pretty great view of city if the skies are clear. Tip: Try to go early in the morning, as it can get very, very busy. Take a red truck from anywhere in the city and kindly ask them to go to Doi Suthep. It should be about 60 Baht per person. The ride will take about 30-45 minutes depending on traffic up the winding hill. Or you can take the 2-3 hour hike to the top. 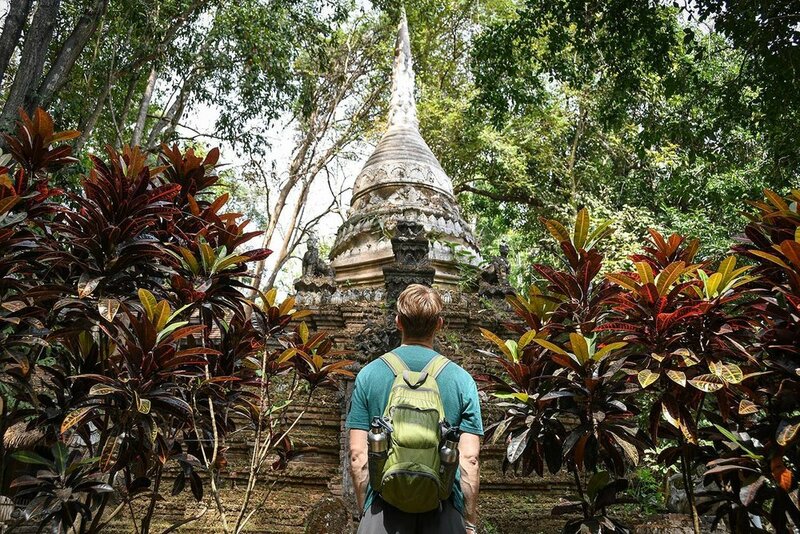 You can do it on your own, or try joining the local hiking group and check their schedule to see if they'll be making that hike while you're in Chiang Mai. If you’re lucky enough to be in Chiang Mai during the month of November, you can observe the Loy Krathong and Yi Peng festivals, which take place around the same time. The date changes each year due to the lunar calendar, so do you research. More Info: Here's a detailed article on activities during Loy Krathong and Yi Peng festival that will help you make the most of this celebration. Chiang Mai is famous for Muay Thai fights, and we enjoyed seeing the action in person while in Bangkok. You can even take classes at many gyms in Chiang Mai. Whether you try it yourself or watch a match, experiencing Muay Thai fighting is a fun thing to do in Chiang Mai. With Doi Suthep mountain towering over the city, there are countless opportunities to get outside and do something memorable. This “canyon” is an old quarry that now attracts mostly foreigners trying to get “off the beaten path”. While it is no secret anymore, it still has a feeling of being relatively unknown to many travelers passing through. Get there by motorbike (an easy drive) or by tuk tuk/songathew (red pickup truck). Split the fare with other travelers to make it more affordable. There is an onsite café which serves a small selection of food that's a bit on the pricey side and just mediocre, but it “fills the hole”. 2018 Update: We have been told the Grand Canyon has now been turned into a water park of sorts with platforms and inflatable toys. It sounds like a bunch of fun, but the entrance fee has increased and is currently 450 baht (up quite a bit from 50 baht when we were there in 2015). Seeing an elephant up close is almost on everyone's bucket list in Thailand. But we wanted to let you know a little insight we've learned while living in Chiang Mai: It is not uncommon for elephant parks to call themselves "sanctuaries" without truly being kind to the elephants. We've heard stories that after tourists leave, the way they treat their animals (and staff members) isn't always great. Our first time traveling together in Thailand, we visited Elephant’s World in Kanchanaburri. While we didn't experience or see any mistreatment of the animals, we are now more aware about this issue still facing Thailand's tourism industry. We've heard mixed reviews even about some of the popular sanctuaries in Chiang Mai. We've had friends who had great experiences at Elephant Nature Park, though we haven't experienced it ourselves. One lesser-known place we have heard from others that is ethically run and the elephants are returned to their natural habitat (and not fenced in) is Kindred Spirit Elephant Sanctuary (no affiliation). They provide a better life for the elephants and also work to improving villages and alternate work for the mahouts. We encourage you to do some research ahead of time and choose a place that is (hopefully) treating elephants well. And if you end up somewhere that is not ethically run, SPEAK UP. Tell their management of what you saw. Write a review online so others can be informed and decide if they want to support it. Tip: The good places book up in advance -- so plan ahead if seeing elephants is a must for you. If you'd like to support elephant protection and conservation, consider making a visit to Elephant Parade Land. Here, you can visit their museum and see where these lifesized baby elephant statues are made. Local and international artists paint these statues at the onsite workshop, and also create smaller versions that you can take home as a meaningful souvenir. If you don't have time to visit Elephant Parade Land, you can simply stop in their retail shops in Nimman or Old City to purchase your own souvenir elephant and support this cause. This project was started to help fund the creation of a prostethic leg for a baby elephant name Mosha who had lost her leg. Elephant Parade helps fund the work of the Friends of the Asian Elephant Hospital, where Mosha and other injured elephants are being treated. Located just off highway 11 between Lampang and Chiang Mai, you can actually visit this hospital if you have time. Visiting hours are between 8:30 a.m. and 5 p.m. and we'd recommend calling in advance. Similar to river tubing, you can cool off on a hot day by floating on a bamboo raft! 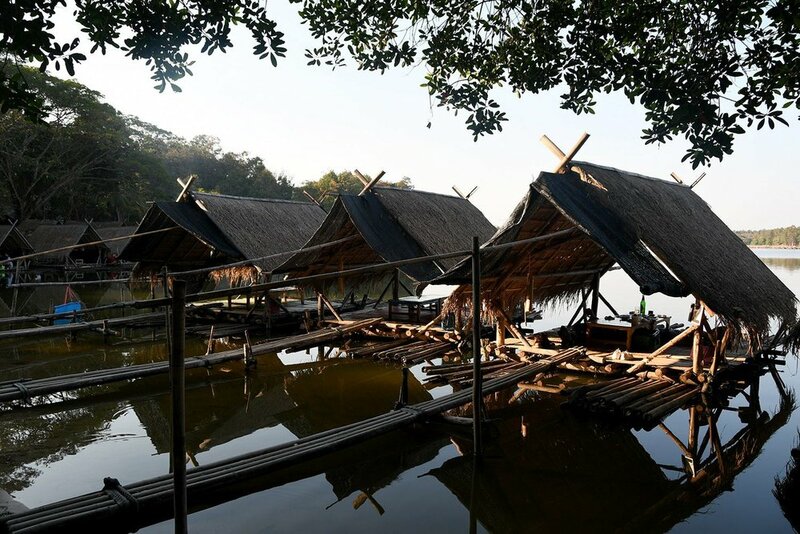 Check out Tieland to Thailand's article on bamboo rafting. While it looks like fun, we have heard it is a long trip to get to the river for a rather short rafting ride. There's actually some decent rock climbing in Chiang Mai. If you are a climber (or want to learn), consider booking a climbing day in northern Thailand. Who knew Chiang Mai is well-known for its mountain biking?! If you like to get gnarly on mountain trails (is that what the kids are saying these days?! ), book a mountain biking tour and explore a different side of Chiang Mai. Flight of the Gibbon is by far the most popular of the Chiang Mai zip-lining companies, but there are many high-flying adventures to choose from. While Chiang Mai is Thailand's fourth largest city it is surrounded by jungle and mountains. Be sure to get out of the city and experience the nature that lays just beyond the bustling streets. There are a couple sections to the tiered-waterfall, but our favorite was at the very bottom where the falls drop about thirty feet and you are able to climb around them. It's a great way to cool down on a hot day! After you're done playing the falls, head up the small set of stairs opposite of the falls which leads to the source of the spring. The spring itself is a deep hole filled with vibrant blue water. We rented a motorbike for this journey, and found it quite easy. The roads are all paved and flat, but you'll have to watch out for traffic. The drive takes about 1 hour and 15 minutes from the Chiang Mai Old City north on Route 1001. You'll know you're getting close when the road starts winding up hill and bordered with trees. You'll see a sign for Bua Thong Waterfall on the right and take that turn to enter the park. If you don't feel comfortable on a motorbike, you can always ask a red truck (songthaew) to take you and a group of friends (typically up to 8 people) to the falls. Local Tip: Sometimes Google Maps falls short of details around Chiang Mai. The best app to find hiking trails around Doi Suthep mountain is Maps Me. Download the app and then download Chiang Mai region. Not far from the Nimman neighborhood, Huay Kaew Waterfall is hidden in the jungle, and few travelers know it exists. A visit to these little-known waterfalls is a good way to escape the city and find some solitude. When we went, we only crossed paths with a handful of people. Unlike Sticky Waterfalls, you can't climb on the actual falls, but if you stick to the side path you'll make it to a swimming hole, complete with a rope swing! The best part was we were the ONLY people there. On a hot day, this would be a great place to bring a picnic and relax. Check out our hike to Huay Kaew Waterfall video on YouTube. Responsible Travel Tip: If you bring food, please, PLEASE carry out your trash. It is really simple to get to the Huay Kaew Waterfalls. From the old city you can take a red truck to the Chiang Mai Zoo (30 baht per person). Starting from the entrance of the Chiang Mai Zoo, walk west toward the mountain. You can take the mountain road uphill until you see the official entrance, or walk our favorite way through a local street to the left just as the road begins to go up hill. Stroll through this tiny neighborhood with a stream passing through the middle and walk to the end of the street. There will be a small foot path the leads uphill slightly and will take you to the waterfall. Related: Some of the best waterfalls in Thailand are north of Chiang Mai in a town called Pai. Check out our detailed guide to Pai, Thailand for more information. If you love the outdoors, but you don't want to hike solo, we've got a perfect solution for you! There is a hiking club in Chiang Mai that meets ever Saturday (as well as some weekdays) to go hiking in the jungle surrounding the city. Some days the hikes are short and for beginners, while other times they are full-day expeditions and lead to hill tribe villages in the mountains. Check out the hiking club's Facebook page, Doi Suthep Walkers, for details and upcoming hikes. These weekly meet-ups are typically on Saturday mornings at 7:30 a.m. sharp. Note: This group is great, but the crowd tends to get large, especially for the shorter hikes. The hikes we have been on have had about 50 people going up the mountain. The people who join are really fun and are typically foreigners living in Chiang Mai long-term, with a few travelers sprinkled in. If you are excited to meet new people and get outside the city, this is a fun (FREE) option for you, but do know that the group is not small. Your taste buds will feel like they have died and gone to heaven. You can order any type of cuisine in Chiang Mai, but be sure not to leave the city without learn how cook Thai food. And you probably also know that we are constantly raving about taking cooking courses in other countries. We’re up to 9 now. We wholeheartedly believe that there are few ways to learn more about a culture than through its cuisine. Sidenote: We also heard great things about Sammy's Organic Thai Cooking School. Tip: If you are visiting in November during the Loi Krathong festival, you might be lucky enough to make your very own krathong in your cooking class, which you can float down the river alongside locals in the evening. Book ahead because classes during this season fill up quickly! Huay Tung Tao Lake is a place many tourists never visit. In fact, we didn't hear about it until our third time in Chiang Mai. This lake is a popular place for locals and expats to go for morning runs and hiking in the surrounding trails. At lunchtime, people come to eat in one of the many floating restaurants around the lake. While the food isn't anything spectacular and it's a bit pricier than you'd pay in the city, it's a unique dining experience. The restaurants seem to be more or less the same, and they charge a per person fee to eat in the bungalows over the water. The restaurant we ate at charged 20 baht per person for the lakeside tables, while the ones a few meters back on land were free. Tip: If you're feeling up to it, we'd recommend hiking while you're at the lake! The hike to Taab Mook Waterfall is quite easy and you'll be rewarded with a beautiful sight. Traveling by motorbike would be your best option to get to the Huay Tung Tao Reservoir. From the old city travel west on Huay Kaew Road and turn right on Highway 127. Travel north for about 4 km and then turn left when you see signs for the lake. If you come to Highway 107, you have gone too far. You could also order Grab car (Asia’s version of Uber) and it should cost about 100-150 baht. Another way to get there would be to talk to a songthaew (red truck) driver and negotiate a price. You would probably play about 100 baht per person and you would need at least 4-6 people. Cost: There is a 50 baht entrance fee for foreigners. If you enter before 7 a.m., it is free. With a Burmese influence, this dish most commonly found in the north of Thailand; and Chiang Mai is a perfect place to try your first bite. The best place to eat Khao Soi is on the street. We sampled several bowls, and each has their own unique flavors. Traditionally, Khao Soi is eaten in the morning and afternoon, so many Khao Soi street stands will close before dinner time. You'll still be able to find it on the menus of many restaurants. Khao Soi Mae Sai this is a hot spot among locals and is not far from the Nimman neighborhood. This is one of our favorite bowls of Khao Soi! Khao Soi Nimman is a decent choice in the Nimman Road area with many different choices. Broth is on the sweet side and prices are a bit higher than most Khao Soi. Khao Soi Khun Yai is a tiny little stand on the edge of Old City that is always packed with tourists. It earns rave reviews on TripAdvisor and on other blogs, and while we thought it was good, it wasn't our favorite. Their Khao Soi has a broth that is a bit thicker and spicier than most, but I was a little disappointed that it comes with pieces of chicken instead of a whole leg, and the crunchy noodles on top were not that fresh. Khao Soi Arak is located in the Old City and known for serving a killer bowl of Kaho Soi. Plus the couple who owns this tiny restaurant is lovely. At just 30 baht, you can't go wrong! Free Bird has a vegan Khao Soi so you can give this famous dish a try even if you don't eat meat. If you like street food, don't miss the famous Cowboy Hat Lady featured on Anthony Bourdain's show Parts Unknown serving Khao Kha Mo (Thai-style stewed pork leg). Her stall is located near the north gate of the old city at the Chang Phuek Market. The pork and rice dish can be served in a small size (40 baht) or a large size (50 baht) and it literally melts in your mouth. Insider Tip: We don't like fatty pieces of meat, so order ours “mai ow nang” which means without skin and fat. While we're on the subject of food, there are so many Northern Thai dishes to try, you're going to leave this city fat and happy. This article from bloggers Tieland to Thailand does a great job describing some Northern Thai food you have to try in Chiang Mai. While we're on the topic of food, the restaurant scene in Chiang Mai is UNBELIEVABLE. From street food to world-class dining, and from traditional Thai to any type of international cuisine you can think of, you really can find a restaurant for every mood in this city. Oh, and if you're vegetarian, you will be in heaven, as there are endless vegetarian and vegan restaurants in Chiang Mai. If you want to do good while eating well, there are some restaurants where your money will go to support a cause greater than just your hungry tummy! If you love eating and giving back, we think you'll really like Free Bird Cafe. Located near the north gate of Old City, this non-profit, vegan cafe donates 100% of profits to their charity which supports a community learning center for Burmese refugees. How incredible is that! Check out their selection of goods for sale -- we love that they sell items that are good for the environment, like bamboo straws, menstrual cups and reusable bags. Plus, there's an section of second hand clothing near the back of the restaurant where you can pick up (old) new clothes or donate any items that are weighing down your backpack! Also, Free Bird Cafe hosts a Women's Lunch every Wednesday from 12 - 2 p.m. where you can mingle with other female travelers passing through or meet women who call Chiang Mai home. You’ll have no problem finding vegetarian food in Chiang Mai, but one great option to get your veg on is at Pun Pun Restaurant. The produce is organic and is sourced from their own farm, so you can feel good about what you’re eating. Even though eating here is healthy and supports the sustainability movement, you won’t be paying much more than any other local restaurant. Pun Pun Restaurant is located behind the grounds of the Wat Suan Dok temple and is only open until 4 p.m. Have a leisurely late lunch/early dinner before participating in a Monk Chat. As you walk through the streets of Chiang Mai, it may seem like the popluation is half Thai and half foreigner. This city is a major hub for people working online so this sections is common things expats do while living in Chiang Mai. If you're craving a day relaxing in the sun, head to one of the many pools in Chiang Mai. And don't forget your sunscreen! Center of the Universe: Located just north of the Nimman area, this salt water pool (less chemicals, yay!) is 200 baht for an all day pass. Green Hill Apartments: Lay out by these two massive pools all day for only 80 baht per person. If you get hungry, they also have a restaurant on-site. Le Meridien: This upscale hotel has a rooftop pool with a fantastic view. If you're lucky you can be there when Le Meridien hosts their pool parties which are very fun! Check their Facebook page to see if they have any upcoming events. If you're stiff from a long plane ride, Chiang Mai is the perfect place to get your downward dog on! With plenty of yoga studios throughout the city, you'll have no trouble finding a class. If you're on a budget, you might want to try one of the free yoga classes offered daily in Chiang Mai. Nong Buak Hard Park: Free classes daily from 9 - 10:15 a.m. If you don't have your own mat, you can rent a straw mat for 15 baht. Join the Yoga in the Park - Chiang Mai Facebook group for more info. If you'd prefer to practice your inversions within the walls of a studio, there are plenty to choose from. Most classes are quite affordable, usually starting at 200 baht. If you purchase multiple sessions up front, the price per class will be cheaper. Ananda Yoga: There are two locations within Chiang Mai (Jing Jai Market and Nimman). We had a membership at the Nimman studio and really loved the classes. We always felt challenged and got a good workout. Yoga Tree: One of the most popular studios in Chiang Mai, this studio is located in the southwest corner of Old City. Yoga Kuukan: Located not far from the north gate of Old City, this studio is inside a traditional wooden Thai house, giving it a nice atmosphere. We went to one class here, and were joined by only 3 other students. Catmosphere Cat Cafe: Cuddle friendly felines while sipping a specialty drink. About Pencil Coffee: Cotton candy lattes and a ball pit will bring out your inner child! Clay Studio Coffee: This garden oasis will make you forget you're in a city. Want more? Here are 19 Unique Cafes in Chiang Mai. Be aware that many of these are actually located quite a ways from the city limits. But if you have a motorbike and are looking for adventure, visiting a few of these could be a fun day trip! Whether you're visiting during rainy season or you want to escape the midday heat, popping into one of Chiang Mai's malls can be a surprisingly fun way to spend part of the day. While we aren't exactly "mall people", we were pretty impressed by the shopping centers in Thailand. While there are several malls in Chiang Mai (Central Festival, Central Plaza, Promenada Resort Mall, to name a few), we are most familiar with Maya Mall. Eat a pancake with your face on it: There' s a small shop on the 3rd floor where you can get your face printed on a variety of things, from a keychain to a pancake to a cookie. Have a drink at the rooftop bars: Take the elevator to the 6th floor, where you'll step out onto the rooftop. Whether you just want to see the view or you want to enjoy a beer with the sunset, it's worth a stop before you leave the mall. Watch a movie in style: The movie theater on the 5th floor of Maya shows the latest movies, and has a handful in English. On Wednesdays, movies are just 100 baht. If you want an extra special experience, go for the VIP theater where you can enjoy super comfy chairs, complimentary popcorn and a soda for just a bit more money. Explore the cutesy shops: Moshi Moshi and Daiso are Japanese shops that sell inexpensive items that you don't really need, but you'll definitely want. Visit the food court: The floor below ground level has a food court filled with local options that are tasty and affordable. Get your WiFi on: If you need to use the Internet for a bit, pop into CAMP, which is a co-working space on the 5th floor of Maya Mall. Purchase a beverage or snack and get 2 hours of complimentary WiFi, or buy an Internet card at the AIS store on the 3rd floor. It is 150 baht and can be used to access the Internet in CAMP and other places around the city for one month. Entertain your inner child: On the 5th floor you'll find an arcade with air hockey, arcade dance games and more. And nearby, you'll find virtual reality pods that cost 100 baht for a simulation of your choice. When you visit Chiang Mai you can't miss the numerous songthaews, or red trucks, on the roads. Songthaews, literally translated means "two rows". They are converted red trucks with two padded bench seats in the bed and act as shared "taxis" throughout the city. Red trucks are our favorite way to get around Chiang Mai. Not only are red trucks plentiful and help reduce the number of cars on the road, they are fairly inexpensive costing only 30 THB ($0.93 USD) per person anywhere within the old city. Hail down a red truck just like you would a cab or a tuk tuk, and they will pull over on the side of the road. Say hello (sah-wah-dee) to the driver and tell them the general area you are going. It may confuse them if you request a specific hotel or restaurant. We typically request one of the old city gates, or a popular market, and then just walk the rest of the way. If they know where you are going, they will either say "Okay" or state a price per person. If they don't say a price, it is understood that the price is 30 baht per person. The drivers are pretty good about getting to where you want to go, but if they go past your stop, you can ring the bell on the ceiling and they will pull over. Hop out and pay the driver. Chiang Mai's nightlife scene isn't as lively as many other major cities, as the bars must "officially" close at midnight, but there are still some fun places to have a drink with new and old friends. Whenever we're in search of a good view, we head to a rooftop bar! Akyra Manor: Lounge beside their rooftop pool with a fancy cocktail in hand. They have 2 for 1 drinks for their happy hour special from 5:30 p.m. to 6:30 p.m. Enjoy the views as the sun sets behind Doi Suthep. Xanadu Rooftop and Restaurant: This classy rooftop is on the 17th floor in the Furama Hotel. You can get great views of Nimman and Doi Suthep as you order a meal and drinks. Oasis Rooftop Garden Bar: Tucked away in the northeast corner of the old city, Oasis presents a relax vibe and a nice place to meet up with friend. If you're looking for a fun night out on the town, consider seeing a Cabaret Show! RAM Bar will show you a good time with live performances every night starting at 10 p.m. The dancers are super talented and you'll see several acts during this 1.5-hour show. Our advice would be to arrive early, as these shows fill up quickly and it is a very tiny venue. The drinks are on the expensive side, but the show is free, so we found it worthwhile! Northgate Jazz Club: This ultra-popular venue can get super crowded, especially on Tuesdays when they host an open mic night. Expect to be standing on the street, mingling with other music-lovers. Thapae East: This venue is super cool and hosts many events. 7 Pounds: This bar is a hidden oasis, and we’re obsessed! With a garden lit by fairy lights, decently priced drinks and a big stage for performers, this low key bar is tucked away in a quiet street not far from Maya Mall and will make you feel as if you’ve discovered a local secret! Manung Bar: This 50’s diner themed bar is popular with a young Thai crowd and is a great place to catch some live music. We arrived around 8 p.m. and it was empty, so we had a cute vintage booth to ourselves. But beware, this place fills up fast once the music begins! There were hardly any foreigners in this bar, which gives it a totally different vibe than many places in Nimman. Mellowship Jazz Club: Live music every night of the week. A little bit more upscale, but a pretty nice place if you want seating, food and nice drinks while enjoying live music. We decided long ago that we will not knowingly contribute to attractions that exploit people or animals while traveling. A picture, in our opinion, just isn’t worth the suffering of others. We know all too well that it is often times hard to know if a company is socially responsible, so we try to share what we’ve learned along the way. We hope this information helps you formulate your own opinion about visiting some controversial sites on your travels. You will undoubtedly be pestered by tuk tuk drivers shouting “Tiger Kingdom! I take you to Tiger Kingdom!” After doing lots of research on the subject and talking to others who have visited this attraction, we have very strong feelings about this type of tourism. And we made a firm decision not to support it even though, yes, having a picture with a large cat would be quite cool. We had a wonderful experience at Elephant’s World in Kanchanaburri (near Bangkok). But if you are in the northern part of the country and desperately want to see these giants, visit the reputable Elephant Nature Park. Here, you can be assured that your contribution is not harming the animals, but instead is ensuring they have a healthy and happy life. Several tour shops advertise tours that take you to a hill tribe village where you can see the famous “Longneck” people (this actually refers to a subgroup of the Karen people). Although we can’t speak from experience, some people we spoke to who had done these tours said it felt like group of people on display in the name of tourism. Others claim that many of these villages main source of livelihood comes from tourism. We, too, are intrigued by the indigenous tribes, but are still unsure of how we feel about this. It is no doubt a complicated issue that brings up many feelings in different people. Our advice would be to do a little research and decide where you stand on this topic. If you do decide to visit a hill tribe village, be sure to choose a company that is paying the villagers fairly and operating in an ethical way. Also, do some research on the history of these indigenous group - many of whom are refugees - and you will have a much more meaningful experience. There are plenty of amazing hotels in Chiang Mai. If you're looking for the best place to stay during a short visit, we'd recommend finding accommodation near Tha Phae Gate (the east part of the Old City or just outside). Bodhi Serene Chiang Mai Hotel - In the heart of the old city, but secuded on a small street that makes it the perfect combination. With nice outdoor pool and a business center, it's great for families or business professionals. Vieng Mantra Hotel - Situated steps away from the Chiang Mai Tha Phae (East Gate), you and your hunny can have a great night out downtown or relax by the pool and bar at the hotel. Vida Guesthouse - Simple, clean and comfortable rooms for just 350 baht ($10 USD) a night is a steal! The rooftop terrace is lovely, the staff is helpful and not super pushy, and the location is top notch. This tree-shaded neighborhood in the Old City is quiet and has an abundance of adorable cafes. It is close to a local market, street food, and isn’t too far from the major sites. Based off of location and value for our money, we enjoyed our stay at Vida Guesthouse. Big and O’s Guesthouse - We weren’t as crazy about the location as at Vida Guesthouse, but it's near the night market and main gate which is packed with street food in the evenings. The location isn't bad, but it is in a pretty crowded, busy and noisy area. The guesthouse itself is nice, with comfortable dorm beds and AC, but the thing that makes it a winner is the staff. We have never experienced hospitality like we did at Big and O’s. The family who lives there is lovely, and they sleep near the entrance so it almost feels like a homestay. If you’re looking to find a home away from home and a family you’ll fall in love with, stay here. Have you been to Chiang Mai? What was your favorite thing to do in Chiang Mai? We'd love to hear from you in the comments below.